This morning the sun rose, birds sang among pink and white blossoms, another day dawned on glorious planet Earth. For thousands of years, millions of people who lived long before us enjoyed the rising of the sun every day. Aboriginal communities had an early morning ceremony to welcome the return of the sun to the Earth. Long before development of industrial consumer societies, millions of people enjoyed the abundance of Nature and a leisure society. They lived happy lives, and were low energy consumers, their needs easily met, unlike our present societies, where hunger, anxiety and insecurity are rampant. They spent around 3–5 hours daily procuring food, and had a nonchalant attitude to the few possessions they had. Hunter-gatherer societies, as anthropologist Marshall Sahlins reported in issue 18 of Pacific Ecologist, were the original affluent society. Today, despite marvellous technology, and gadgets galore, we are confronted, as never before in human history, by a complex of problems, created by ourselves, which threaten all life on Earth. We are told it’s progress, but how can the state of the world today be termed progress? From our origins, living in paradise here on Earth, we are creating hell on Earth, destroying its marvellous life on which we depend, and we are at war with our fellow human beings. Continually erupting wars since 2001 perpetrated by rich western countries led by the US on third world countries, notably Afghanistan, Iraq, Libya, Yemen, Somalia and Syria, have killed millions of people, and displaced many more. Done in the name of security and democracy and costing trillions of dollars, the wars have divided and damaged countries and regions, collapsing societies, causing chaos and misery on an unprecedented scale. The huge flood of refugees recently pouring into the EU from Iraq, Afghanistan, Libya, Syria, Yemen, Sudan will continue. Late in September 2015, Dominik Bartsch, the U.N.’s deputy humanitarian co-ordinator in Iraq, said 10 million people were expected to need humanitarian support by the end of 2015 in Iraq alone, where 3.2 million were already displaced and an exodus of 500,000 people from Mosul in Iraq is expected soon. Even in Aotearoa New Zealand we live with a background of continual wars we are asked to support. Despite the grief and grievous killing and destruction, the west has acted with impunity and a chilling lack of regard for the right to life of millions of people. The Islamic State terrorists created by the wars are a mirror image of the US and its allies. The West’s war psychosis presents a death-dealing image to the world that threatens civilisation everywhere. Above all, the wars have shown that far from developing security they cause more wars and greater insecurity. In another threatening move, the US in 2014 challenged Russia by firstly supporting a coup to displace a government in Ukraine that it didn’t want, leading to a civil war between the new regime and supporters in East Ukraine of the previous government. This was followed by the US pressing the EU to apply harsh economic sanctions against Russia after it took back Crimea and its naval base, previously part of Russia. A compliant western press asked no questions and repeated Washington’s propaganda at every step. Very recently, the US went a step further. Germany’s ZDF public television network on 22/9/2015 reported that the U.S. will deploy to Germany 20 new nuclear bombs, each 4 times the destructive power of the Hiroshima bomb. Former Parliamentary State Secretary in Germany’s Defence Ministry, Willy Wimmer, of Chancellor Merkel’s conservative party, the Christian Democratic Union, warns these “new attack options against Russia” constitute “a conscious provocation of our Russian neighbour.” The constant baiting of Russia and China, which is also being surrounded by US military bases, risks annihilating all life on earth through use of nuclear weapons, either accidentally or deliberately. We must now call on the US government to transform its foreign and domestic policies away from endless wars, to cultivate real security worldwide, addressing inequity/injustice concerns and the increasing problems of global warming which worsen yearly, even as military budgets increase. A new culture of co-operation around peaceful initiatives to build security for all is urgently needed. Secondly, we must call for a shift away from the huge environmental destruction from rampant development, which threatens catastrophe on a global scale by destroying the ecosystems on which life depends. Thirdly we must call on governments to change a financial system that results in gross inequities between rich and poor worldwide, making a very few hugely wealthy while billions struggle in misery. These terrible problems can be resolved. By changing the mindset, we can find our way to far better, happier sustainable society, where people live co-operatively in harmony on the Earth. Despite decades of effort to address these problems through the United Nations, dangers increase. The United Nations plans for nuclear disarmament have been ignored for 70 years by the five major nuclear powers. As advice from the International Panel on Climate Change on the need for action becomes increasingly clear and compelling, debate between rich and poor countries drags on as they argue over responsibilities to reduce carbon emissions. The Convention on Biodiversity is unable to achieve its aims, and the Millennium Development Goals to reduce poverty are struggling in the face of ongoing wars with millions of displaced refugees. A great stumbling block to resolving our increasing problems are the principles driving today’s so called global economy. A world view or paradigm is the over-arching philosophy or values imbued in a society. Today a dominant world view has developed of the global economy, uniting people and countries worldwide with agreements to deregulate trade with endless economic growth, and financial profits as life’s main aims. This “economic” view of life stems from outdated western values, based on humans as the most important species on Earth. The earth and its ecosystems are seen as resources to grow wealth with the help of science and technology, with no consideration of the consequences. The natural world is simply seen as a resource with no economic value until it’s transformed into food, housing, transport, communication and entertainment systems. Little account is taken of the natural world as a globally interrelated commons with a complex order. As a result the atmosphere, oceans, waterways and land are polluted, with damaging consequences for the life they support. The disastrous effects on key ecosystem elements, like soil, bees and butterflies, and the food we eat, are not considered important until the consequences are seen to damage the economy. The economic world view also leads to human conflict over the Earth’s resources, vital for continued economic growth, which conventional economists and industrialists and governments believe we must continue forever. This conflict over access to key resources to keep the global economy on track is at least partly responsible for the continually erupting wars of the West. Sadly, this economic world view regards Nature as a limitless resource. This self-evident fallacy is the source of the environmental damage now observed. Yet this western view of nature, for us, or our corporations to use as we see fit, has been shown to be out of step with newer scientific discoveries on the unity of life. In the 1960s molecular biologists found that the basic structure of all life forms is made of the same 20 amino acids. Most scientists these days agree that all life on Earth emanates from the same source. 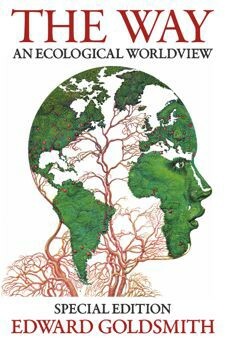 The economic world view is also out step with Earth Systems thinking of the late 20th century that all ecosystems are integrated. Many born into western society today are increasingly uncomfortable with the western economic world view of infinite growth. It doesn’t fit with what we see around us and is clearly destroying life. In Aotearoa New Zealand we are fortunate to be able to learn about the traditional Maori cosmic world view. Jim Williams reports in issue 2 of Pacific Ecologist that their “attitude to nature was founded on a deep-seated sense of shared origins and blood kinship with all elements of the cosmos.” In the Maori world view, “all things animate and inanimate are linked and all Maori are linked to members of the natural world; all whakapapa descend from one extended family.” With this view, traditional Maori learned respectful ways to harvest food. Appropriate strategies were adopted which lead to a genuine conservation ethic in society, key values being: mana (authority, power) and tapu (sacred). Whakapapa is also linked to the future in a duty owed to generations to come and to the natural world. 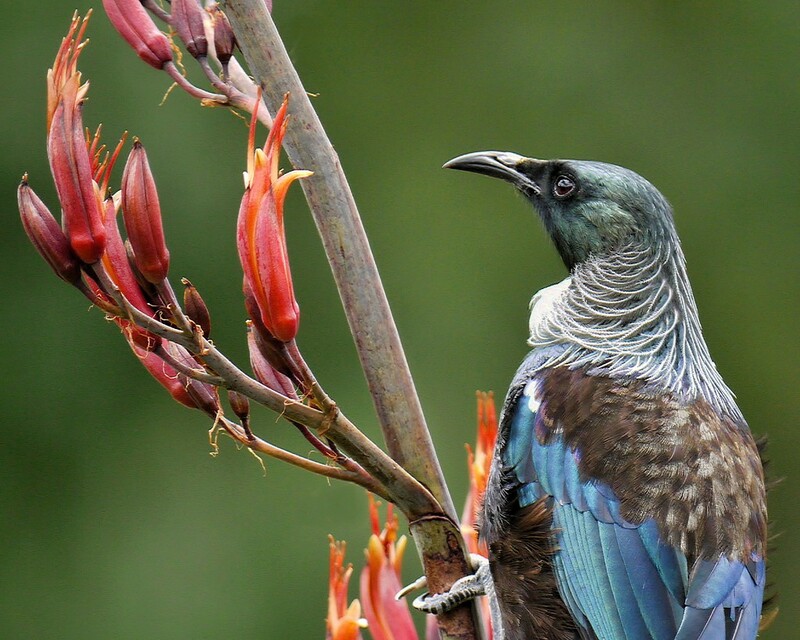 The ecological world view has much in common with traditional Maori, and other indigenous people’s views on the inter-connectedness of nature. 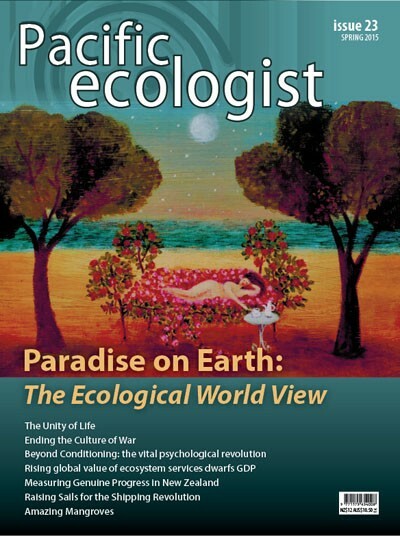 Revered ecologist, Edward Goldsmith, co-founder of Pacific Ecologist in his book: The Way: An ecological world view, notes that Oxford ecologist Arthur Tansley coined the term ecosystem in the 1930s, to define a community together with its abiotic environment. Eugene Odum another distinguished ecologist defines ecology as the science of the structure and function of nature, or the structure and function of Gaia as James Lovelock refers to the biosphere, including its atmospheric environment. For Odum ecology is a super-science, or unified science. The first president of the American Ecological Society, Barrington Moore, said ecology is a science super-imposed on other sciences, a science of synthesis to understand the structure and function of the biosphere. This means the ecosphere cannot be understood by dividing it into separate spheres of knowledge, or erecting barriers between different life processes. Compartmentalising knowledge into different disciplines has created aberrant theories leading to a consumer society, unrelated to biological or geological reality. The life-destroying economic world view, continues to dominate governments, despite all the evidence. As easy to get fossil fuel dwindles, plans proliferate worldwide to drill for oil, gas and other resources in difficult terrain, amongst Nature’s great treasures, the deep oceans and sensitive ecosystems. Fortunately there are now many people and organisations around the world, including in New Zealand opposing such developments and the building of costly polluting motorways. A primitive economic paradigm is destroying life in front of our eyes. But hope lies in the pioneering work of Herman Daly and others on ecological economics which has been developing techniques since the 1970s to estimate the financial benefits of ecosystem services. This has led to a recent study by Robert Costanza and others, reported on page 46. They estimate that globally nature’s services dwarf gross domestic product, the main measure of economic progress, by a factor of almost three. The study also reports a $20.2 trillion annual loss of eco services from 1997–2011 caused by an oblivious economic system. The narrow GDP measure urgently needs to be replaced by inclusive measures of wealth, e.g. the Genuine Progress Indicator, see page 34, which includes the health of ecosystems and the well-being of people. With the UN’s Sustainable Development Goals now announced and sustainable indicators to be finalised in March 2016, it’s vital to promote further development and implementation of the new economic measures. Such an obviously essential change for our very survival should come easily, but the old paradigm is supported by a powerful clique. All our voices are needed to bring this essential change. Australian visionary, Ted Trainer in his insightful article, page 38, on renewable energy studies, draws attention to the impossibility of renewables providing anything like the amount of energy presently consumed, let alone ongoing economic growth demands. Relying on biomass as many plan to do, will further deplete biodiversity already under threat, and bring a holocaust of species loss, and increase greenhouse gases. Trainer says we can live well on renewables, but not in the unsustainable energy-intensive consumer society. He offers the Simpler Way, an alternative society that could make the big cuts needed in today’s rich-world consumption levels. In the Simpler Society there would be far less production and consumption. It would provide the basic essentials of life, such as nutritious food for all in sustainable ways without harmful chemicals destroying nature. It would be a true leisure society, celebrating and looking after nature. People would share knowledge and work; there would be many more artists, poets, musicians and gardeners. Such an ecological society would better reflect the beauty we see in nature every day. The major obstacle to sustainability is the conditioning of our minds to various beliefs. J. Krishnamurti and physicist David Bohm, page 15, discuss the dangers of psychological conditioning with its divisive knowledge of nation, family, beliefs, tradition, habits, etc. They wonder why people accept being immersed in so many problems. Each person being conditioned to nationalism and personal habits, produces the situation where resolving problems becomes impossible. No country looks at the whole, and there’s no way to solve issues through the prism of self-interest. The inability to solve problems, based on “national security” is obvious in the continual wars inflicted on far away countries by rich western countries which have only increased insecurity and violence. It’s also likely to lead to the ultimate ecocidal violence, release of nuclear weapons of mass destruction. Yet as Krishnamurti comments: “Earth is not English earth or French earth, Earth is Earth” (page 18). Similarly a human being is a human being, not Russian or American, Australian or New Zealander. A psychological revolution is far more essential for our survival than a technological revolution. This vital issue is almost never considered or discussed. The “national interest” has also prevented effective solutions to address climate change at international meetings and prevented nuclear disarmament resolutions over 70 years at the UN. Moving beyond the primitive conditioning that has narrowed our minds is vital. Here lies the psychological revolution, and perhaps discovering the real basis to unify humanity and our connection with the vast community of life. Can the Earth itself and love be our inspiration?